Translucent ceramics was born in Shigaraki, Shiga prefecture where a producing district of ceramics and one of the Japanese six ancient kilns exist. 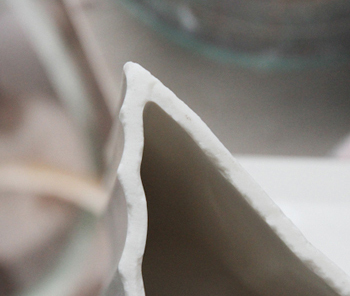 Originally, ceramics don’t allow light to pass through, however, this clay has a special quality which allows light to pass through even if it is thick. SOUHOUGAMA has developed translucent ceramic washbowls for the first time in the world with the translucent ceramics of a patented technology. There are 3 features for the ceramic of Shigaraki broadly. 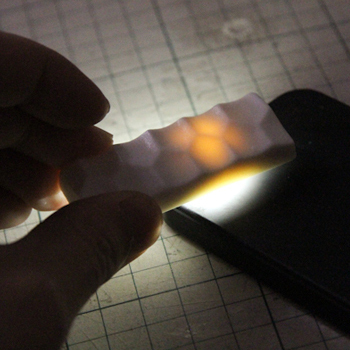 Even the thick ceramic transmit light. A thickness of section is 7~8mm. We can mold it with a potter’s wheel, forming by hand and by casting.It also doesn’t change in large when it’s burnt, so it’s possible to use glaze. The coefficient of thermal expansion and coefficient of contraction are close to a usual china clay when it’s burnt, so it’s possible to knead with a opaque china clay.→It’s possible to express a pattern like stripes and marbles.We are developing new products to use this clay in Souhougama. We aim at a new generational pottery to develop products with a tradition of Shigaraki brought up with history and climate, new designs and new materials.